When we were hiking in Door County last week I chuckled when Aida told me that that this big hole was “the dark side of mother nature.” Where did she get that? I, unfortunately did experience the dark side of mother nature this morning. In the middle of the night, I was having dreams about people throwing confetti on me. I’d half wake up and take a little piece of it and throw it on the ground next to my bed. At daylight, I woke from the daze with another little confetti bit on my arm. I was alarmed to find a tick embedding itself into my arm. I screamed and ran to the toilet to flush it. I returned to bed to try to sleep a little more, only to find another tick crawling up my arm. Okay, panic at this point. I rouse the dark side of mother nature daughter out of the bed. A couple of more ticks fall to my arms and I flush them. I am now offiically heebee-jeebeeing. The final tick falls from onto my back while I am making lunch. Okay, that whole thing is disgusting. I called Orkin (they’re coming Wednesday), we tick prevented the dogs, I stripped the beds and my skin is still crawling. This is what the ticks looked like…. 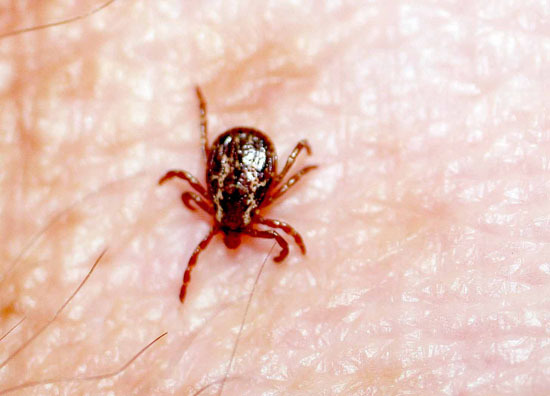 Wait — these ticks were all in your house?! Not in Door County? Eeeewwww! I would have run screaming to the lake and jumped in, I think! You poor thing!